The Microfabrication Core Facility (MFF) was host to 15 students from the Summer Youth Program (SYP) on the 18th of July (and a further more on the 25th of July), aged from 12 – 14 years. The students learned about the fabrication of silicon based devices and how silicon wafers are produced. 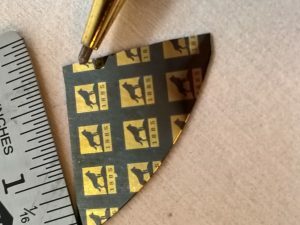 Additionally, they had hands on experience in the cleanroom and used the photolithography process to transfer a pattern on a photomask to a silicon wafer. The pattern had a scale on it from 100 um (diameter of a human hair) to 1 um (diameter of bacteria) to allow the students to understand the scale that MFF users work at. 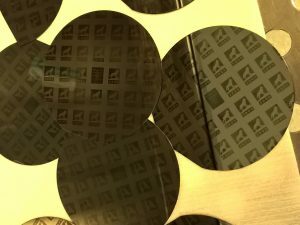 The students also hand cleaved silicon wafers to produce dies of gold Michigan Technological University (MTU) logos as a keepsake for their time in the MFF. 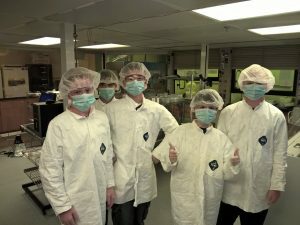 The last group of five students gowned up and ready to do the photolithography process. If you are interested in what the MFF can do regarding teaching/research/K-12 contact Dr. Chito Kendrick, cekendri@mtu.edu or microfabrication@mtu.edu.